In this post, Shahrin shares her secrets for nailing English Advanced for the HSC. Shahrin Shamin scored 93/100 for HSC English Advanced, received a Band 6 in three subjects AND an ATAR of 97.90! In this post, we provide Shahrin’s Year 12 HSC English Advanced Hacks. My name is Shahrin Shamim and I recently graduated from Sydney Girls High School. Personally, I find that I’m more interested in humanities rather than sciences so my HSC subjects were English Advanced, Maths Extension 1, Legal Studies, Economics and French Continuers. My interest in writing and literature is something I hope to pursue in the future and in the upcoming year I am hoping to undertake a double degree in Law and Communications at either UNSW or UTS. To stay on top of my workload and make my study for English more effective, I used the following step-by-step process. From the very beginning, I made sure to read the texts several times throughout the year. I sought out copies of all my prescribed texts at the end of Year 11 so that I could read them for the first time throughout the Christmas holidays. This might be a slightly controversial approach but I prefer to do my initial reading of the texts without analysing at the same time. In doing this, I formed my own interpretations of the texts, and most importantly, I actually enjoyed it. This meant I was more engaged when it came to analysing the texts later on. If you are unsure of how to do this, you should read Part 2 of the Beginner’s Guide to Acing HSC English, How to Analyse Your English Texts for Evidence. My second reading of the text was when I was going through it in class. With the guidance of my teacher and class work, this is when I did the bulk of my analysis, research and note-taking. I think that it’s really important to be as proactive as possible during this stage because the more extensive your notes are, the easier it will be to write essays and paragraphs when it’s closer to exam time. If you’re unsure of how you should style your notes for English, you should read this. Two weeks before internal assessments, I was usually drafting my first practice essay and beginning to send them to my teacher, Matrix English teacher or tutor, or sometimes both. I found feedback to be really essential in providing perspective and making sure my essays were focused on answering the given question, rather than just showcasing the fanciest language techniques I could find. 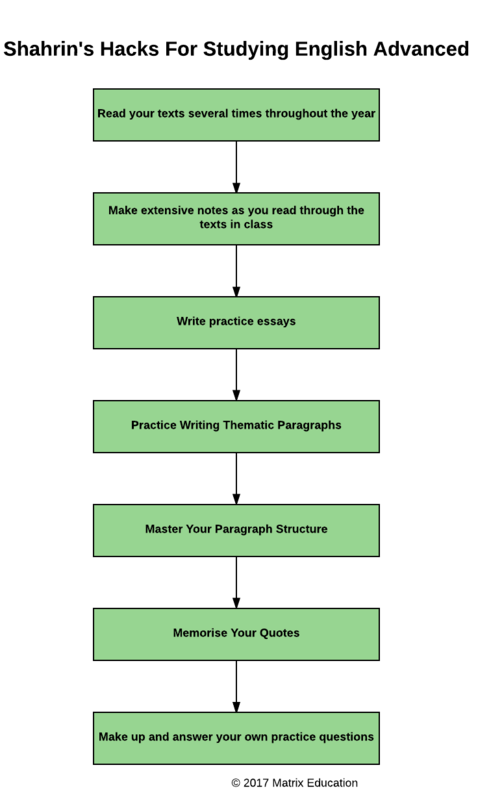 You should read this guide on how to write an essay if you need to get started. After the initial round of feedback, I would tweak my essays accordingly and, if I had the time, resend them for another review by my teachers. It’s really important that you learn how to edit your own work. This guide on how to edit your essay will give you some guidance on how to do it. One thing that was really important in my exam preparation was writing paragraphs in terms of the main themes of the texts rather than whole essays. Of course, I did always have a few practice essays up my sleeve but I discovered (the hard way) that doing this was very limiting when it came to actually answering the exam question. Writing thematic paragraphs prepared me for a whole range of questions and was a good exercise in adapting to possible questions that may arise in exams. It also prevented me from memorising whole essays and regurgitating them on to the exam paper regardless of whether they answered the given question or not. Memorising essays is an easy trap to fall into (one that I am definitely guilty of initially falling into myself). While it seems like an easy option for the first few internal exams it will definitely not work for trials or the HSC, and I cannot emphasise this enough. If you are unsure of how to use evidence, you should read this for more detail. The last few days before an English exam, it’s really important to be memorising quotes in terms of the issues presented in the texts and practising how to adapt existing essays/paragraphs to a range of different questions under exam conditions. This means actually writing it out on paper and with a set timer, not just typing on a computer. By this point, I had usually collected most of my notes and written paragraphs on a vast range of themes so I was doing at least five past papers before an English exam. Speaking of past papers, I always made sure to focus my attention on the hardest questions, and even made up new questions based on themes that hadn’t been previously examined. This meant that I covered all grounds and I wouldn’t be left too shocked in the exam hall, no matter how much of a curveball the question was. When trials came around, I was expecting to be really overwhelmed by the workload after speaking to older students and hearing how stressful it was. In reality, I was actually really surprised to find that the workload wasn’t as impossible as I thought it would be, and this is because I had done the majority of my work for each module during the other internal exams. As a result, I mostly focused on refining existing paragraphs, writing essay plans for really difficult or obscure questions and doing past papers under timed conditions. The night before the trial exam, I did just one past paper and then spent the rest of my time scanning through questions from other schools’ trial papers and writing down in dot point form what my thesis and arguments would be. I think this approach left me in good stead because it meant that I knew how to respond or adapt to a range of different questions. Similarly, studying for the HSC exams was not too difficult because I had already collated all my resources during all my internal exams. However, because it is an external exam and there really is no limit to what NESA can ask, it’s best to be really cautious and do as many past papers as possible. I did several past papers under exam conditions and made sure to scan them to my teacher so she could provide quick feedback. On another note, while essays are my strength, I have had a bit more trouble with creatives in the past. I made sure to work on this weakness and refined my first creative, while also writing a second just in case. After writing my creatives and receiving feedback, I practised incorporating a range of stimuli into them, either by simply typing in ‘discovery’ into google images or writing my own creative prompts. I also made some flashcards in terms of themes with key quotes and structural techniques and this is what I was really focusing on going into the exam, because by then I already had a strong idea of what ideas the texts explored and what arguments I would write about in my essay so there was no need to be forcing myself to reread whole essays before the exam. I’ve been constantly advocating writing paragraphs instead of just essays, but surprisingly, I was late to the party when it comes to this approach. I made the mistake of memorising my essay for my first internal task and while I didn’t do terribly, I knew that my marks were average rather than excellent because I’d failed to answer the given question and instead regurgitated a pre-written essay. From then on, I began to write paragraphs in terms of themes during my preparation leading up to exams and this led to a great improvement in my marks. So if I could go back to the start of the year, I would advise myself to start using this method earlier. Write as many essays and paragraphs as you can. And remember that you aren’t just doing this to memorise them, you’re doing it to refine your essay writing skills and then produce a quality essay in the exam hall. Read as much as you can – and I don’t just mean only the text. Read critics (especially relevant to Module B), read other essays, watch adaptations of the text. Be as proactive as you can to form your own interpretations of texts because it means you will be genuinely interested in what you’re learning about and your essays will be a lot more sophisticated. Listen to the feedback from your teachers. Most of the time, they have a really in-depth knowledge of not just the text, but the rubric and the marking guidelines too, so it’s really important to take into account any constructive criticism that comes your way. Do not memorise essays. I’ve already said this but I think it’s worth mentioning again because it’s a very limiting approach to exams. Most pre-written essays are responses to past questions and NESA barely ever repeats questions. Make sure to cover as much ground as possible if you want to be adequately prepared. Don’t neglect past papers. They are possibly the best practice you can get leading up to an exam and they’ll help you form a game plan for the actual exam day – whether it be doing the questions in order of your strength or organising your time better. Don’t predict questions. There is a difference between being smart with your time and eliminating close-study of themes that have been touched upon in previous exams and outright predicting exact questions. Like memorising, this will also limit your exam preparation, as well as the quality of your response if the question is not at all like your prediction. Lastly, I think it’s important to remember that after a whole year of analysing every second line of whatever play or book you’ve been prescribed, you definitely know the text well enough to write a substantiated, quality response to any question. It’s easy to become overwhelmed by the sheer amount of content but I found that once I got into the exam room and the adrenaline kicked in, I could remember a lot more than I thought I would. Want to ace English like Shahrin did? Book your free English Lesson today. Join over 4500 students who already have a head start like Shahrin did. Book your free trial lesson today.